UK - It's official! London's favourite live music venue is Union Chapel in Islington, which just happens to be equipped with a great selection of DPA microphones. Union Chapel is a 900-capacity venue housed within a 136 year old Victorian Gothic Revival Church, which still functions as a chapel when it isn't hosting big names from the world of music such as Adele, Bono and The Edge from U2 and Florence & the Machine. 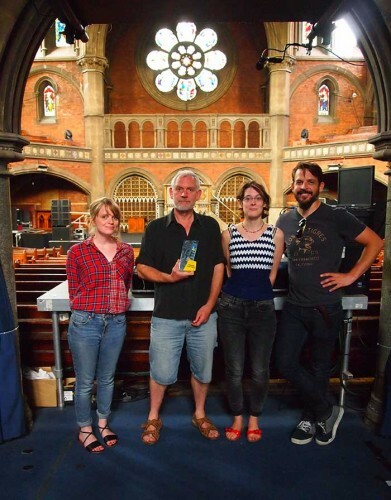 A large proportion of the equipment that artists need to play at the Union Chapel is provided by the venue, which has invested heavily in high quality gear including a range of DPA microphones. Sound engineer and producer Les Mommsen, of 4AM Productions, is head technician at Union Chapel. He says: We cover all genres of music, though due to the unique nature of the acoustics in the venue some artists choose to perform a special acoustic show." Mommsen adds that last year Union Chapel added three DPA d:facto Vocal Microphones to its equipment list and this has really improved the venue's ability to deliver natural and detailed mixes to its audiences. The d:facto Vocal Microphone has been used by a wide range of artists, including Mavis Staples, Scott Mathews and David McAlmont of McAlmont & Butler. "They produce the best results where clarity and vocal intelligibility are essential and this is an area where we have to pay close attention to in our venue," he says. "All DPA products excel in delivering a natural, uncoloured representation of acoustic instruments and these are the precise qualities that discerning musicians and technicians look for in their tools." Union Chapel also has a selection of DPA d:vote Instrument Microphones as well as d:dicate 4011A and 2011C recording microphones. "The versatility of the d:vote and d:dicate range of microphones is constantly surprising us," Mommsen adds. "They just sound great on virtually any instrument from drums through to guitar amps and violins. We are currently looking to add some d:dicate 4006A Omnidirectional recording Microphones to capture the sound of our magnificent, unique and recently restored 130 year old Henry Willis hydraulic pipe organ." In picture: Naomi Miller - venue administrator, Pete Stapleton - venue manager, Emma Stell - events administrator, Les Mommsen - head technican.